During an informal presentation September 11 at Sacred Heart at Monastery Lake, Fr. Jose Gonzales, a Milwaukee diocesan priest, shared his experience of ministering to undocumented migrants at St. Adalbert parish in Milwaukee. 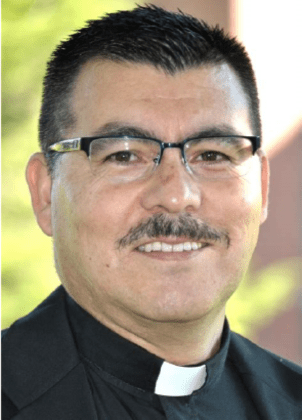 He is pastor of the parish, one of the largest Latino parishes in the area, as well as a member of the Hispanic Ministries staff at Sacred Heart Seminary and School of Theology. Fr. Jose began by sharing his own story of conversion. He was born in Chile and his father was a union organizer. When Jose was seven years old, General Augusto Pinochet overthrew the democratically elected president, Salvador Allende. Fr. Jose’s father “disappeared” for two years, eventually released from a prison camp after being tortured. From that moment on, Fr. Jose and his family lived in a constant state of fear. Eventually, Fr. Jose came to the United States and worked in Los Angeles. There, he said that life became “too comfortable.” He “forgot where he came from.” At a friend’s ordination to the priesthood in South Central Los Angeles, he heard God’s voice asking him “Where have you been?” Eventually, he too was ordained and became a priest for the Archdiocese of Milwaukee. He encouraged people to speak out. “We must accept Pope Francis’ call to encounter the stranger and be prophetic in our response,” he said. “And so for you who are Dehonians, wherever you are, how are you prophetic? Are you faithful to the charism of your congregation? Are you being faithful to reparation? As you know, when reparation happens, reconciliation is possible. “As Dehonians, you must remind us that there is a heart. You are called to be bridge-builders among cultures calling forth the beauty of humanity and yet it is so hard to do. We seem to be more and more polarized, even with our table conversations, they have become so politicalized. Often, we just want to get away from the table and yet the invitation is to stay at the table and stay in the conversation.